Posted in: 1 Pageant Pages, 2 Shout-out-Looks. Tagged: 50th Mutya ng Pilipinas, Arnold Mercado, Ascott Makati, Globe Iconic BHS, Globe Studios, Jontie Martinez, Queenmaker Philippines, Rodgil Flores. I am very pleased to be part of this documentary video – “It Takes A Village to make a Beauty Queen” by QueenMaker Philippines – for the 50th Mutya Ng Pilipinas. Watch me below as I share my thoughts alongside pageant experts/personalities like Arnold Mercado of Aces & Queens, Rodgil Flores of Kagandahang Flores Beauty Camp, Jontie Martinez of Galatea, Shandy Montecarlo Lim, Noel Garrovillo, Makoy Manlapaz and Mark Arthur Payumo Abalos. The docu-video was shot at the Globe Studios of Globe Iconic BHS and during the Final Screening of Mutya ng Pilipinas at Ascott Makati. Posted in: 1 Pageant Pages, 2 Shout-out-Looks. Tagged: Bb. 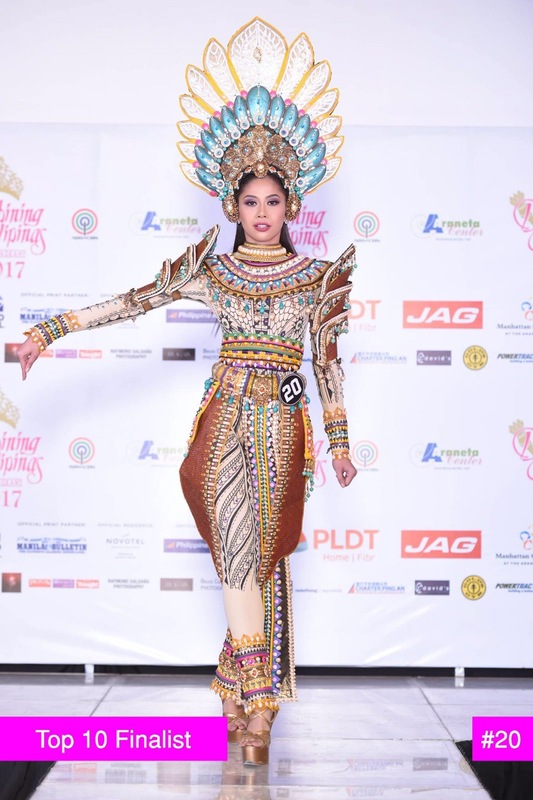 Pilipinas 2017, Cary Santiago, Edwin Uy, Erich Miñoza, Francis Libiran, Frederick Berches, John Cliff, Jontie Martinez, Jun Ilusorio, National Costumes, Nick Guarino, Roland Alzaté. Vote for the Best in National Costume (ONLY) in the Bb. Pilipinas (Official) Page where the picture with the most number of likes wins! 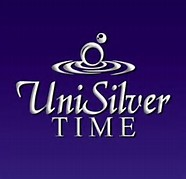 Voting is until Friday the 28th 11:59PM. Posted in: 1 Pageant Pages, 2 Shout-out-Looks. Tagged: Bb. Pilipinas 2017, Chico Estiva, Edwin Uy, Ian Paul Semira, John Cliff, Jontie Martinez, Jun Ilusorio, Mark Bumgarner, Polly Lagyap, Richie Bondoc. 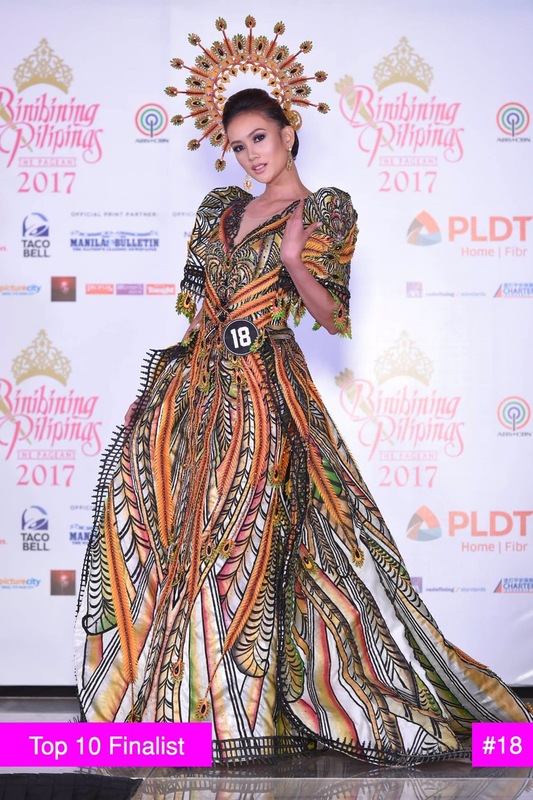 I know that the hardworking Designers who created the fabulous National Costumes for the Binibinis of Bb. Pilipinas 2017 toiled on their respective works so it is but fitting that we give credit to each one of them. 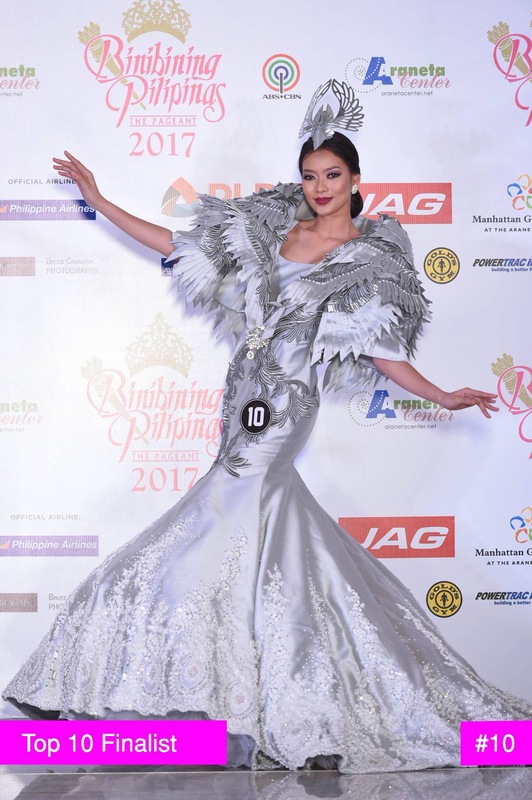 Let’s continue with Binibinis 21-30 dressed up by Polly Lagyap (with Mayor Madeleine Alfelar), Edwin Uy, Richie Bondoc, Mark Bumgarner, Jontie Martinez, John Cliff, Ian Paul Semira, Chico Estiva, Jun Ilusorio and Manny Halasan as officially photographed by Raymond Saldaña below. Posted in: 1 Pageant Pages, 2 Shout-out-Looks. Tagged: Bb. Pilipinas 2017, Clarice Villareal, Galatea Family, Jontie Martinez, Nickky Martinez. Your Binibini 25 is the sole entry of Galatea Family of designer-siblings Jontie and Nickky Martinez. She is Clarice Marion Elbo Villareal, 23 years old, and comes from Antipolo City. This 5’8″ Architecture graduate from the University of Santo Tomas has varied interests which include painting, playing the guitar and playing volleyball. How does Clarice feel that she got in as Official Candidate of Bb. 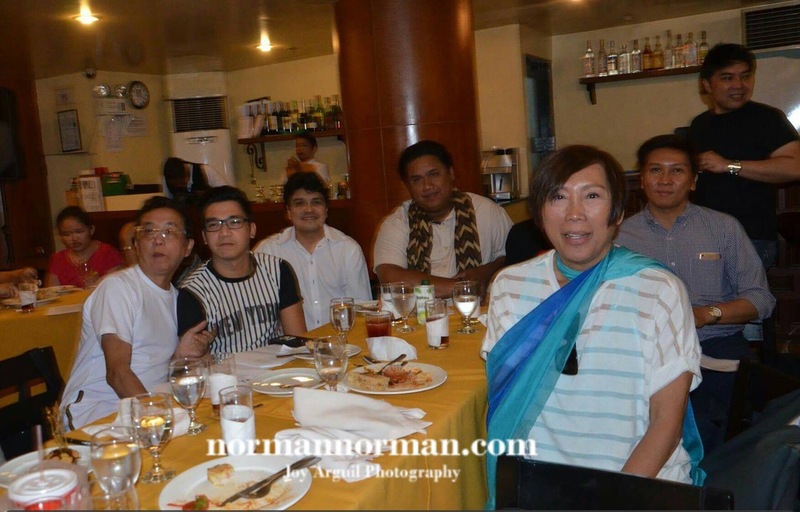 Pilipinas 2017? “Everything still feels surreal. 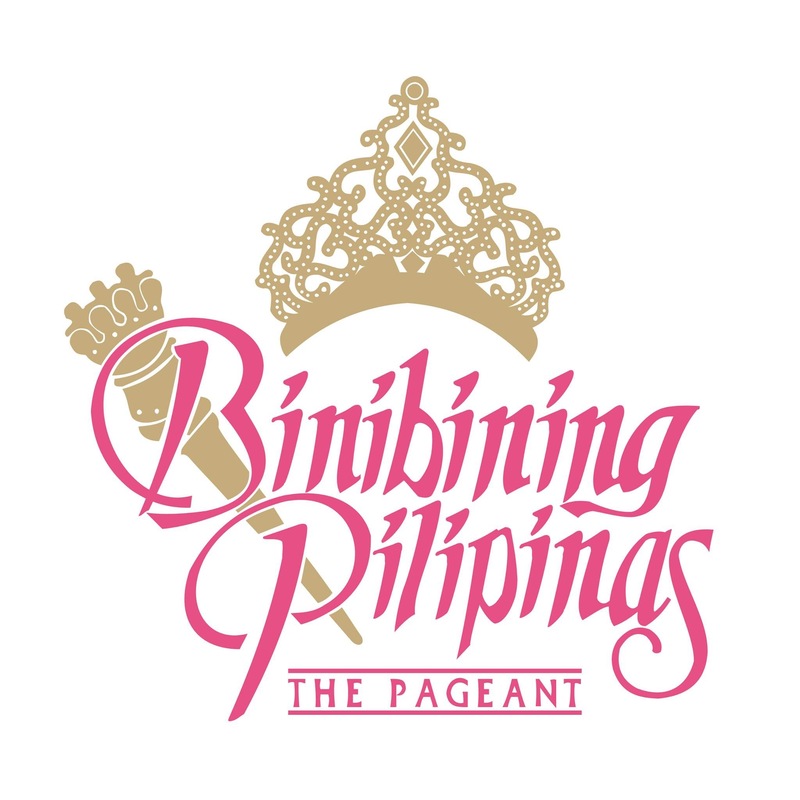 I wasn’t expecting I’d actually land a spot in the Top 40 official candidates of this year’s Binibining Pilipinas – given that I am inexperienced and an independent candidate. Just months before, I attempted to enter a major beauty camp although unfortunately, I didn’t get in. Needless to say, it was really disheartening for me which is why going to the screening was actually a snap decision I made just two weeks prior to it. Not much is known about Clarice except the contents of this article and the video. But it won’t be long till you see her in full bloom as your Binibini 25. Posted in: 1 Pageant Pages, 2 Shout-out-Looks. 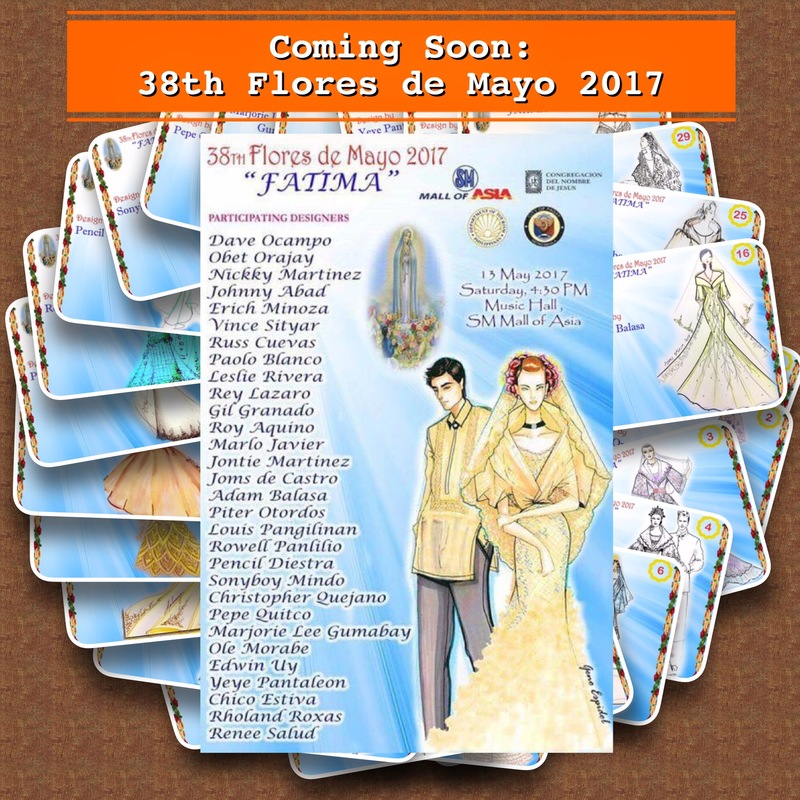 Tagged: 37th Flores de Mayo 2016, Adam Balasa, Congregacion Del Santisimo del Niño Jesus, Danilo Franco, Federico Navarro, James O' Briant, Jontie Martinez, Joy Arguil, Luwalhati, Ogee Atos, Pencil Diestra, Piter Otordos, Rholand Roxas, Vince Sityar. 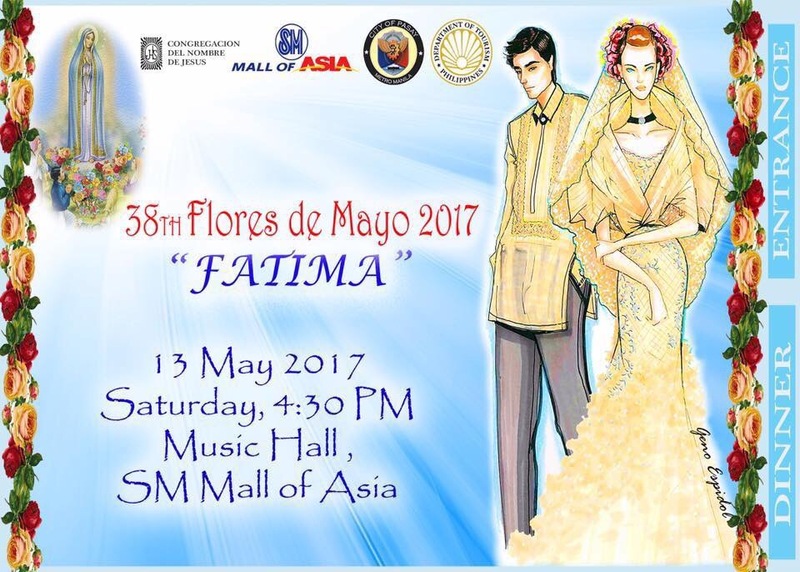 This coming May 1 at the Music Hall of the SM Mall of Asia, the grand 37th Flores de Mayo 2016 will be staged in all its pomp and religious glory. This is the annual gathering of world-class Filipino designers who pool together their talents in an exciting Mayflower event which honors Mary the Virgin, Mother of Christ. It is interesting to note how the member-designers of Congregacion Del Santisimo Nombre Del Niño Jesus have structured the flow of this year’s activity which will revolve around the Glorious Mysteries of the Holy Rosary. 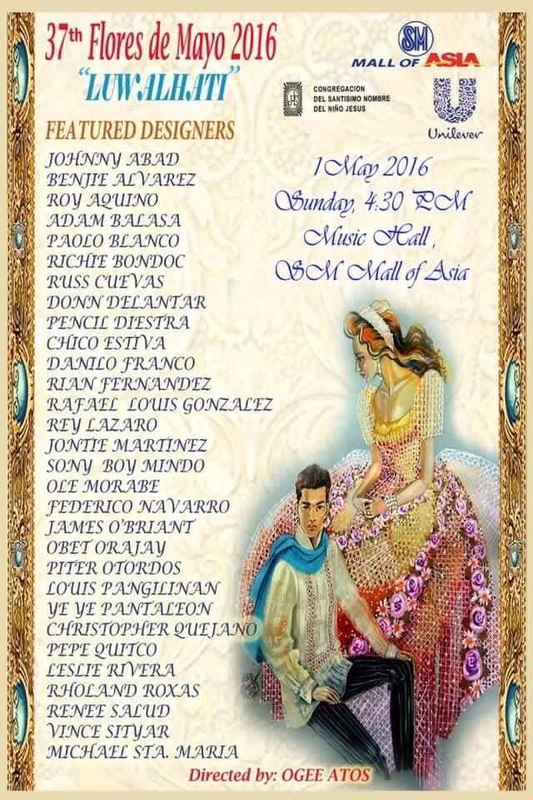 The first part will focus on the actual presentation of the thirty (30) sagalas (maidens garbed in Renaissance/Victorian-inspired gowns) in procession and escorted by handsome men in Barong Tagalog. 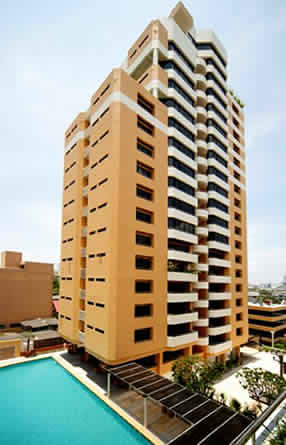 This will be followed by the floral offering and awarding of La Flor de Manila and other important citations. If that’s not enough, there will be a third part where the designs will be inspired by images of the Peñafrancia and other saints. You can expect to see an abundance of colors all throughout as black will not be used in the formal attires to be worn in the same. The featured designers for “Luwalhati” are (in alphabetical order): Johnny Abad, Benjie Alvarez, Roy Aquino, Adam Balasa, Paolo Blanco, Richie Bondoc, Russ Cuevas, Donn Delantar, Pencil Diestra, Chico Estiva, Danilo Franco, Rian Fernandez, Rafael Louis Gonzalez, Rey Lazaro, Jontie Martinez, Sony Boy Mindo, Ole Morabe, Federico Navarro, James O’Briant, Obet Orajay, Piter Otordos, Louis Pangilinan, Ye Ye Pantaleon, Christopher Quejano, Pepe Quitco, Leslie Rivera, Rholand Roxas, Renee Salud, Vince Sityar and Michael Sta. Maria. Director will be Ogee Atos. 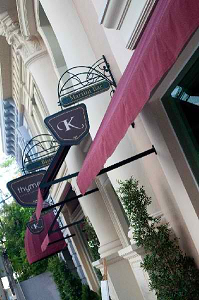 All images taken by Joy Arguil for normannorman.com. Posted in: 1 Pageant Pages, 2 Shout-out-Looks. Tagged: Angelique de Leon, Bb. Pilipinas 2016, Christianne Ramos, Daziella Gange, Galatea, Jennyline Carla Malpaya, Jeslyn Santos, John dela Vega, Jontie Martinez, Leonalyn dela Cruz, Nickky Martinez, R-L's Angels, RL de Leon Lacanienta, Team JDV. John Dela Vega of Team JDV who has Jeslyn Santos and Christianne Ramos making it. RL de Leon Lacanienta of R-L’s Angels for getting in Angelique de Leon and Daziella Gange. Truth be told, each one of them can give really good fights in the competition despite being the Davids to the Goliaths of Aces & Queens and KF. 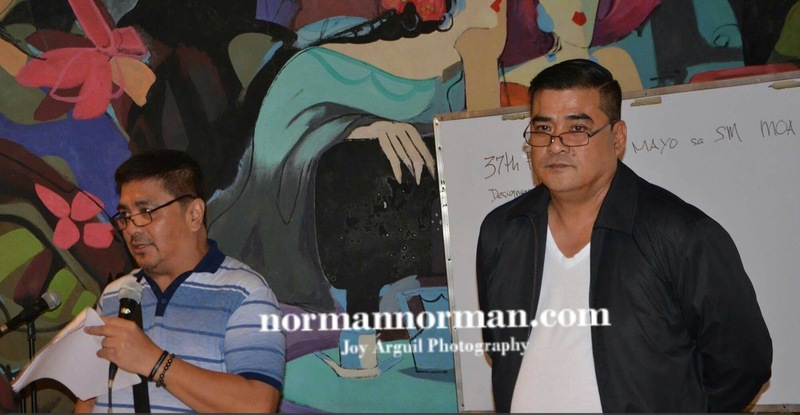 During last Friday’s screenings, in fact, Angelique de Leon (for her wit and joie-de-vivre), Jeslyn Santos (for her much improved version) and Jennyline Carla Malpaya (for her very exotic features and color) registered very well among members of the panel. Also, you just cannot simply count out Daziella Gange who is Miss Heritage Pilipinas 2015 (she represented us and placed 1st Runner-Up during Miss Heritage in South Africa), Christianne Ramos who is Miss Charity Queen Philippines 2015 (she represented us during Miss Charity Queen International 2015 in Taiwan) and Leonalyn dela Cruz, a Professional Model who has vastly gained a lot of experience on the ramp to strut her way more confidently. Who will shine bright? JDV, R-L or Galatea? Who do you see shining among them?